SPX futures are sliding as low as 2720.50 this morning, potentially breaking beneath the rally trendline at 2725.00. 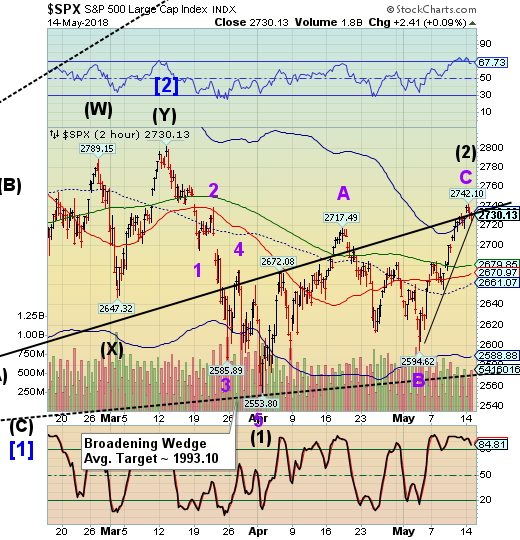 This gives the SPX an aggressive sell signal that will await confirmation from the VIX and NYSE Hi-Lo Index. Aggressive signals are subject to drawdowns, so take due care with any new positions. ... in the process slamming near record Treasury and USD shorts - hence "pain trade" - while leaving a risk-off flavor to markets on Tuesday, with European stocks struggling for traction following declines across Asia, which saw a disappointing set of data out of China overnight , while US futures were roughly 0.2% lower around 7am ET. NDX futures are down and appear to have broken the rally trendline as well. The break of a rally trendline may be considered an aggressive sell signal with confirmation at the 50-day Moving Average at 6745.35. The equities Cycles Model suggests that, once the decline begins, we may see a two-month decline that may wipe out 50-60% of the equity values. In other words, Wave (3) may take that long before it is finished. VIX futures are higher, but must cross the mid-cycle resistance at 13.86 for a buy signal. 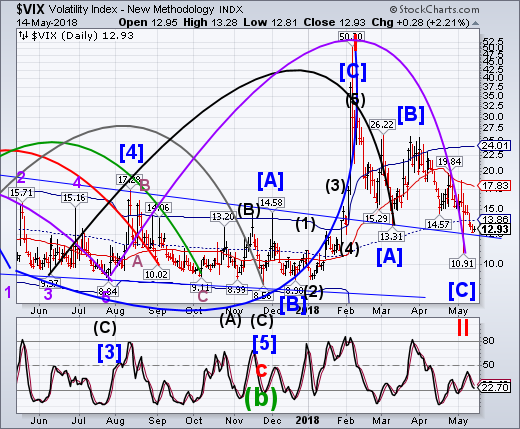 With a futures high of 13.26, VIX has a way to go yet for a signal. The Shanghai Index touched its 50-day Moving Average yesterday and appears prepared to begin its decline. 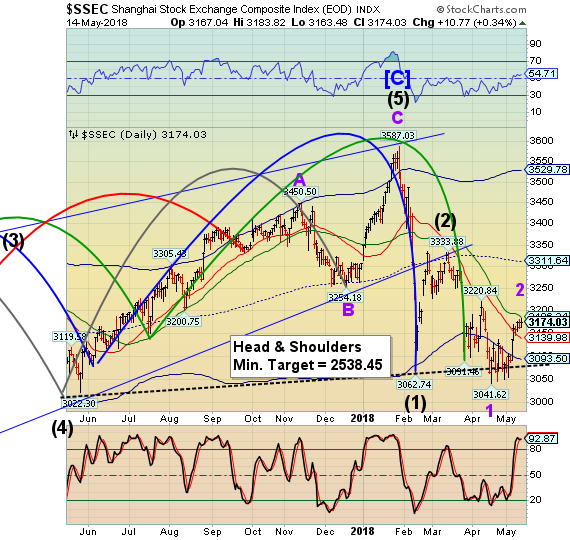 We’ll be watching for a cross of Intermediate-term support at 3139.98 , then the Head and Shoulders neckline at 3080.00-3090.00. for confirmation of the next leg down. Fixed-asset investment rose 7.0 percent year-on-year in the first four months, compared with an estimated 7.4 percent - lowest since Dec 1999. 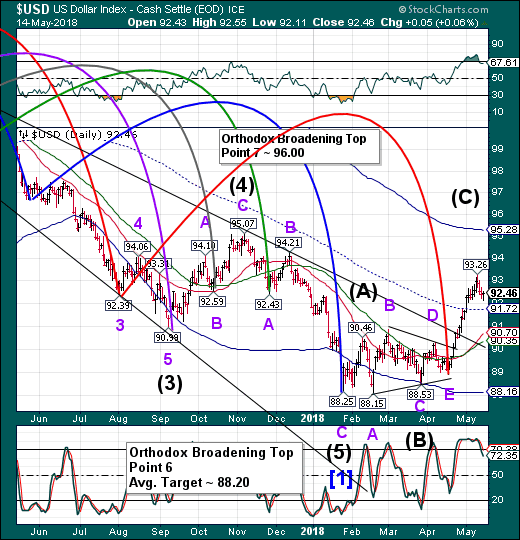 TNX is testing its prior high at 30.35, but hasn’t yet reached it. Remember, it can go up to 30.35, but not beyond, to remain in the current Wave structure. The Commitment of Traders shows that on May 14, the Commercial Traders are 639852 contracts long, while the Large Specs (-408629) and Small Specs (-231222) have the opposite wager. This is a very lopsided trade, which suggests that yields may go down hard, should the markets break. The tension is palpable. USD futures are charging higher after the USD probed toward, but did not make, the mid-Cycle support at 91.72. The Cycles Model suggests that strength may return to the USD for the next week. It this possibly a Wave 3? 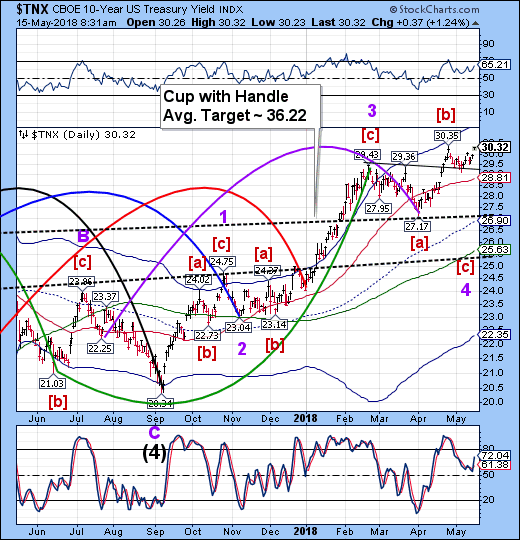 The next target appears to be the Cycle Top at 95.28. 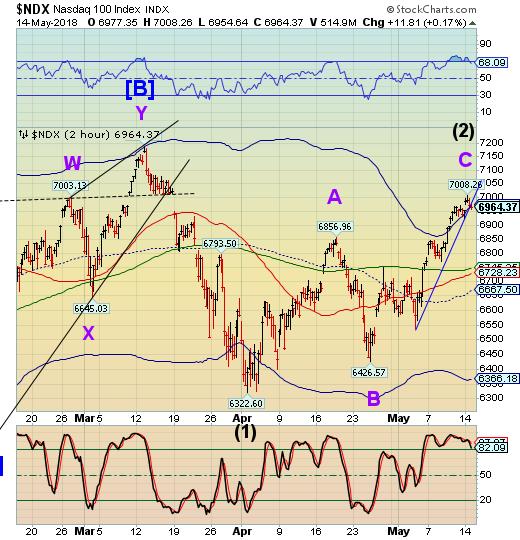 Point 7 may be higher than that, but we will have to evaluate as the rally progresses. Gold futures have taken a big hit this morning, having declined beneath its previous low. 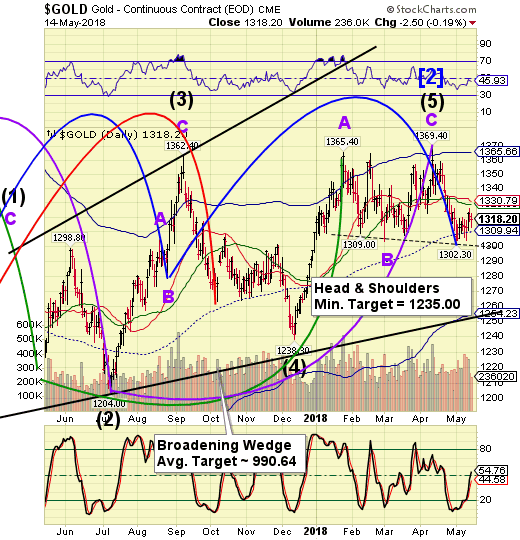 Futures were as low as 1296.20, crossing a potential Head & Shoulders neckline at 1300.00. The Cycles Model suggests a week-long decline that may make the Head & Shoulders target.